The phase φs is found to be 0.13 ± 0.2, in a good agreement with the Standard Model prediction. 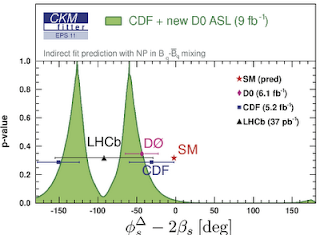 Furthermore, LHCb analyzed different, less frequent Bs decays to J/Ψ f0 (the f0 meson has the same quark content as ϕ but it has 0 spin and decays dominantly to π+π-) which provides another independent determination of φs and ΔΓ. Combining it with the previous one, the experimental error on φs does not change much but the central value is shifted to 0.03. After a short summer break we're back to Higgs hunting. The LHC continues to exceed all expectations with regard to the machine performance as it continues to disappoint (or to test our patience, if you prefer) with regard to discoveries. The latest Higgs search results based on about 2 inverse femtobarns of data were presented by ATLAS and CMS yesterday at the Lepton-Photon conference in Mumbai (though properly it should be called Lepton-Photon-Jet-and-Missing-Energy). The last status update: still no Higgs in sight. Nothing new at first sight, so what's new? 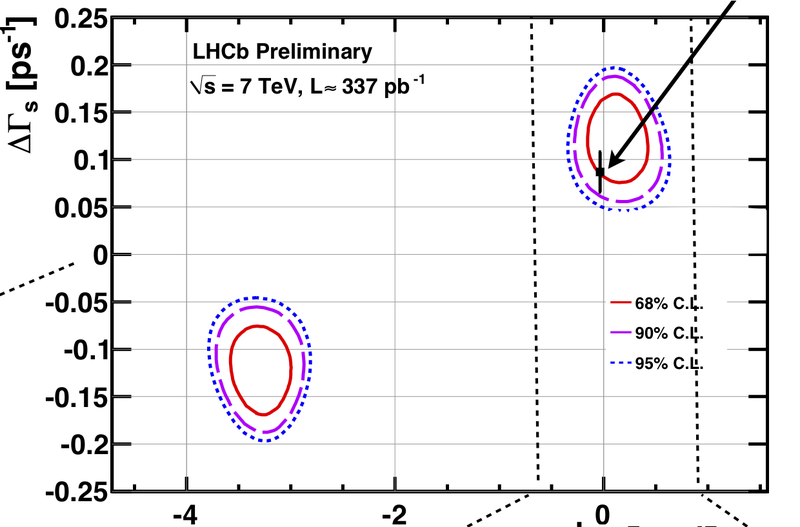 Within the framework of Standard Model the Higgs boson is excluded by at least one experiment in the mass range 145-466 GeV, except for a small 288-296 GeV window that probably would also be excluded if ATLAS and CMS results were combined. Furthermore, the Standard Model Higgs heavier than 466 GeV is by far excluded by precision electroweak observables, mostly by the precise measurement of the W and Z boson masses to which Higgs contributes at the quantum level. This leaves 115-145 GeV as the most likely hiding place. That range shrinked only by a few GeV compared to the limits presented at EPS a month ago. 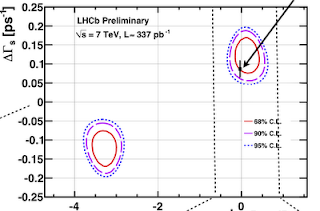 CMS updated several Higgs search channels with 1.5-1.7 fb-1 of data. ATLAS, on the other hand, updated only the 2 channels which provide most of the steam : H→WW→2l2ν and H→2Z→4l, although throwing in a bit more data than CMS. That is because ATLAS is more dependent on European workforce which in August retreats en masse to the seaside. After the EPS conference there was a reasonable hope that an evidence for the Higgs could emerge this summer. 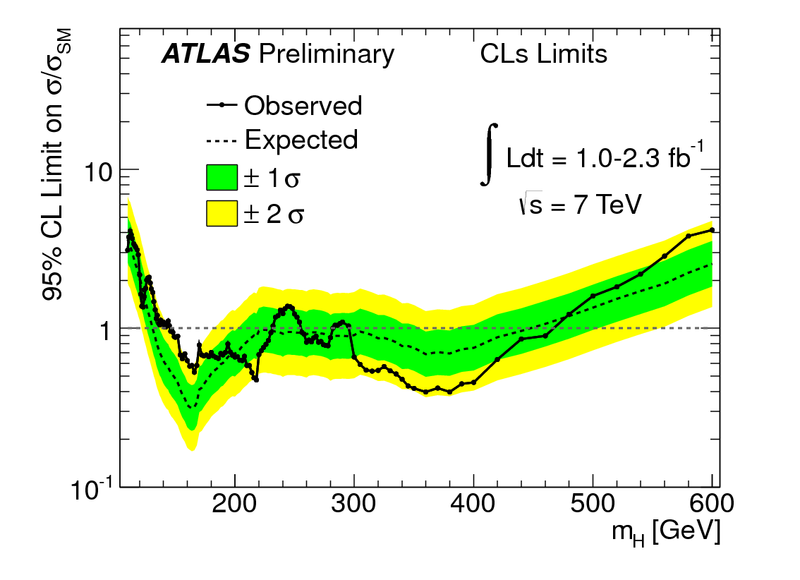 The previous LHC results were suggestive of a 140-ish GeV Higgs boson producing a broad excess in the H→WW→2l2ν channel. 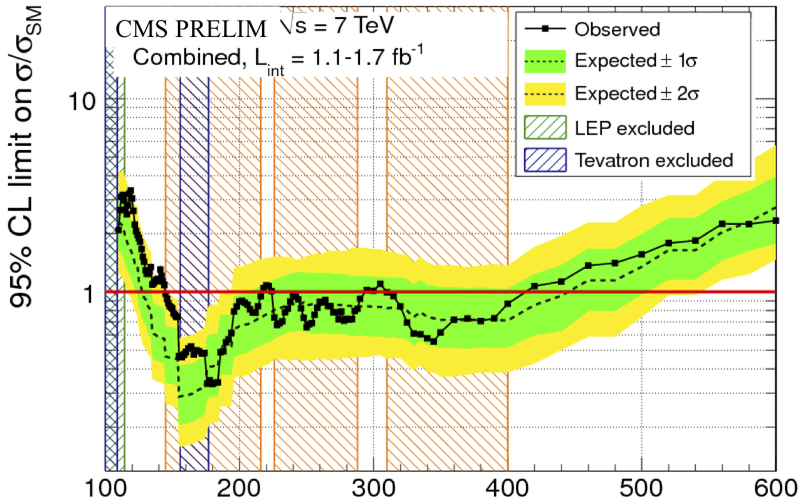 Now it seems that a 140 GeV Higgs is not preferred by the latest data, even if it's not formally excluded: as Tommaso explains in these two posts, if the Higgs has indeed 140 GeV we would expect a larger excess by now. 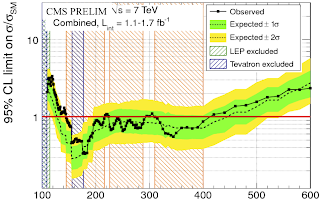 A lighter Higgs, 115-130 GeV, remains perfectly consistent with the data, in the sense that we would not expect to see it just yet. The sample of the "golden-channel" final state with 2 Z bosons decaying to 2 leptons each is growing in size but nothing glitters here. This channel is the leading one for the heavy Higgs, and it retains some sensitivity for intermediate masses above 140 GeV. 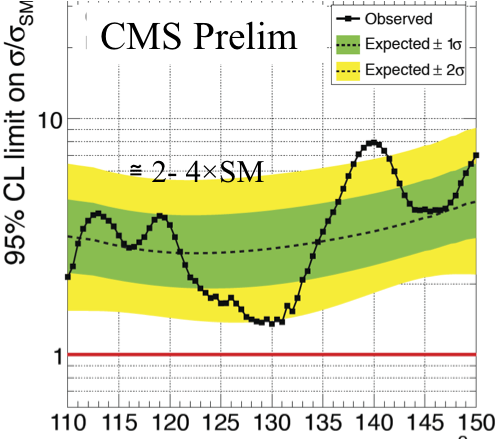 Unfortunately, the shape of the ZZ invariant mass spectrum that emerges has no significant bumps and nicely follows the background continuum. 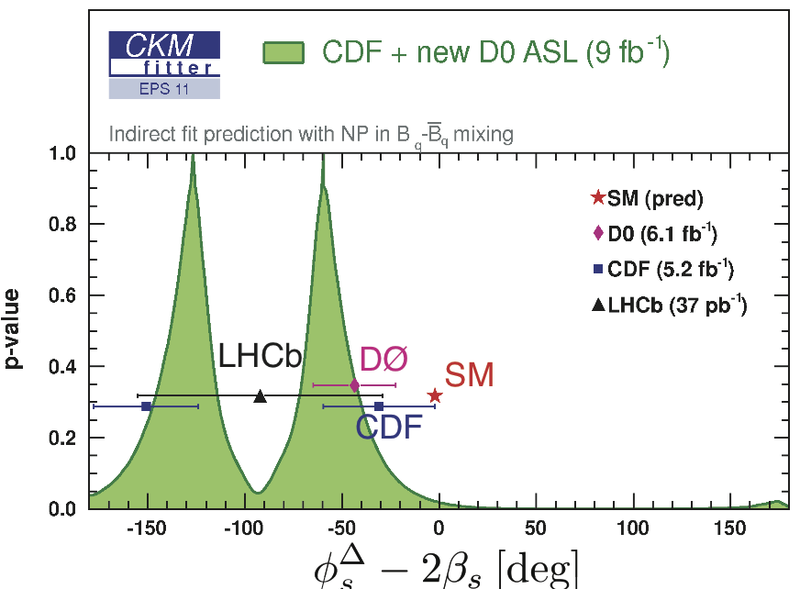 The di-photon sample, whose sensitivity is approaching the Standard Model cross section for a light Higgs, shows no interesting bumps either (the plot below). One should not forget that the LHC limits refer to the Standard Model Higgs. Beyond the Standard Model the Higgs may have a reduced cross section, larger width, invisible or more pesky decays, and so on. Any of these modifications may invalidate the Standard Model limits and make the search more challenging. For the moment the standard Higgs is the priority but we'll think more seriously about the alternatives in case no evidence is seen in 5fb-1. 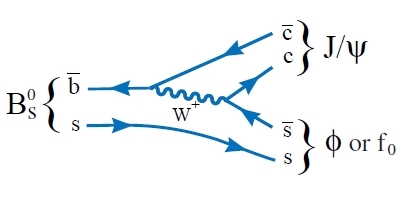 Furthermore, going beyond the Standard Model, a very heavy Higgs above 450 GeV becomes formally allowed provided some other particles mess up into our precision observables. Finally, one can't help but notice that the Higgs, if it exists in the Standard-Model-like avatar, chose its own mass so as to maximize the difficulty of discovering it. If it's a god particle it's Loki rather than Thor.